Internet of Things (IoT) smart devices can be found in many homes across the world. And while these devices have a lot to offer from an entertainment standpoint, the benefits they provide in the business world are perhaps even more impressive. Image Source: Unsplash user NordWood Themes. The IoT boom that’s transpired over the 2010s is showing no signs of slowing down. In fact, there were roughly 23.14 billion connected devices installed in 2019, according to Statista. This figure is expected to triple to 75.44 billion by 2025, signaling that the IoT space is becoming increasingly prevalent as businesses continue to adopt the technology. Companies are bringing IoT into their fold thanks to its ability to increase operational efficiencies, garner new business opportunities, improve a company’s structure and more. Here are the IoT benefits for businesses your organization should keep in mind. Perhaps the biggest benefit that the IoT brings to businesses is its ability to optimize operations by helping employees work more collaboratively. When workers can connect with each other via mobile devices, they enjoy greater autonomy, flexibility, and ease of communication. Employees are more likely to work together since it’s easier to coordinate tasks, even if team members are in different physical locations. IoT can improve productivity by automating some repetitive tasks, allowing human workers to focus on more creative actions. These clever devices also gather data that can be used to reduce the amount of time spent on unproductive meetings. Instead, workers can focus on high-level ways to improve operations. In addition, IoT technology optimizes operations by making sure resources are being used properly. For example, a retail business could develop an automated inventory management system that looks at customer data and data related to every level of the supply chain process. You can then combine historical demand with forecasted demand, processing times and the supplier’s response time to optimize the speed of your operations by eliminating any inefficiencies and resource waste. IoT devices even mitigate risk by predicting whether any operations, devices or systems might fail. They can look at how these failures would affect a business in terms of safety, finances, environmental effects and regulatory compliance. This ultimately leads to more effective operations, reduced costs and a less stressful work atmosphere. IoT devices can collect customer feedback and usage data to determine new ways to offer value. They collect data through a user’s browsing history (for retail purposes), geographic location (useful in the logistics space), vitals (helpful in the healthcare field) and more. Having customer data available through IoT devices ensures that you stay connected with your customer base and provides the information needed to create better products and services. You’ll know where your business is falling short and if any bugs or breakdowns require your attention so you can take action right away. You can also leverage this customer data to create a stronger marketing strategy. Knowing customer behaviors and habits means you will have a better idea of who your target audience is, how to appeal to them and how much you should spend on marketing. IoT devices can be equipped with sensors that keep tabs on any confined or dangerous places or operations. Thanks to their advanced data analysis tools, IoT devices can monitor sensor data to better understand any past hazards in order to prevent such situations in the future. This ability is especially valuable in the manufacturing or energy industry where there are plenty of health hazards. IoT devices can monitor, in real-time, the temperature, humidity and structural integrity of a plant, oil site or mine. Plus, workers can wear heart rate monitors so managers will know immediately if someone is experiencing a health crisis. Using artificial intelligence, IoT sensors can combine the data they compile from workers with factors such as the temperature or elevation of a job site to predict if a heat stroke may be imminent. IoT equipment can even react to any potentially hazardous changes in an environment without human intervention, informing workers if they need to exit the area. All in all, adding IoT devices to your business will streamline operations from top to bottom, making every process easier and more efficient. Businesses that have yet to fully adopt the IoT should consider doing so soon, as this technology is a key way to stay competitive in today’s economy. It’s likely that integrating IoT devices will soon be the norm thanks to their ability to improve operational efficacy and efficiency while also making the workplace safer. Ready to make the leap and add IoT to your business? If so, SevenTablets is here to help. We specialize in custom mobile app development with experience in Internet of Things solutions. We’re also well-versed in other emerging technologies, including artificial intelligence and machine learning, predictive analytics, augmented reality, and virtual reality. 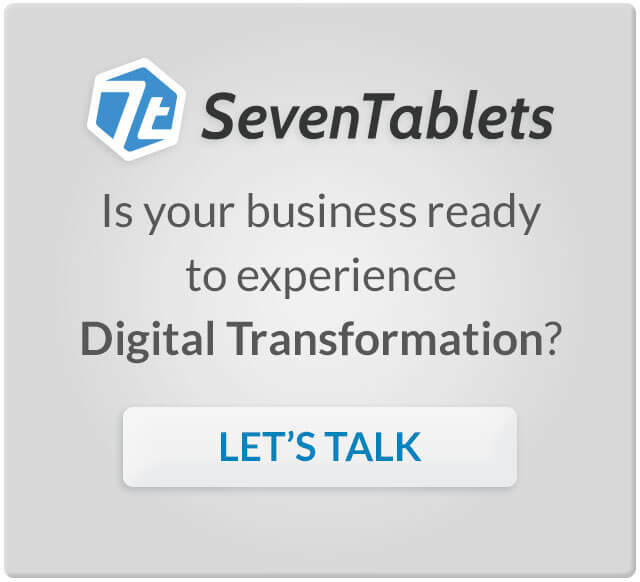 SevenTablets is headquartered in Dallas. However, we are also happy to work with clients in Austin, Houston, and beyond. To discuss your IoT project, please contact us today.